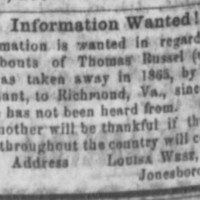 Information is wanted in regard to the whereabouts of Thomas Russel (colored,) who was taken away in 1865, by a rebel Lieutenant, to Richmond, Va., since which time he has not been heard from. 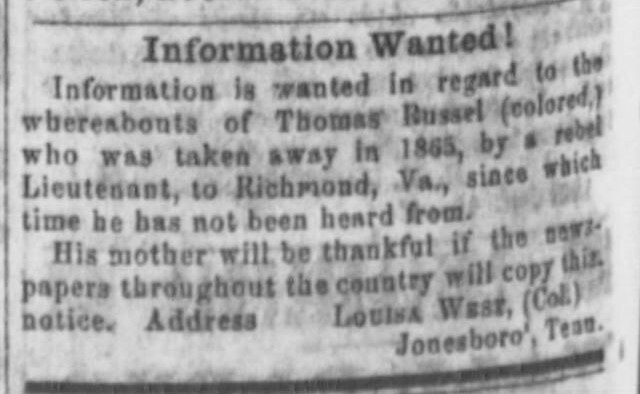 “Louisa West seeking son,” Information Wanted Ad, The Union Flag. Jonesborough, TN, July 17, 1868, Last Seen: Finding Family After Slavery, accessed April 19, 2019, http://informationwanted.org/items/show/1145.